An option is a contract to buy (=call) or sell (=put) an agreed-upon quantity of a specific stock or other asset at a specific price, up until a specific expiration date. 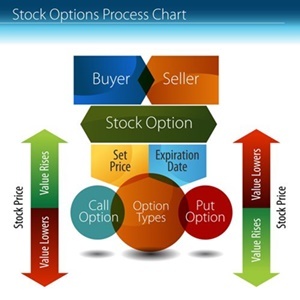 As a stock options trader you can write options on stocks you own, but you can also buy and sell options in the open market with no need to own the underlying stock. Because the value of options is tied to price movement over a given period of time, options are far more volatile than stocks and price changes are dramatic; a $100 stock that goes to $110 has seen a 10% increase, but this might translate to a 100% increase in an option that allows you to buy at $100 anytime in the next six months. 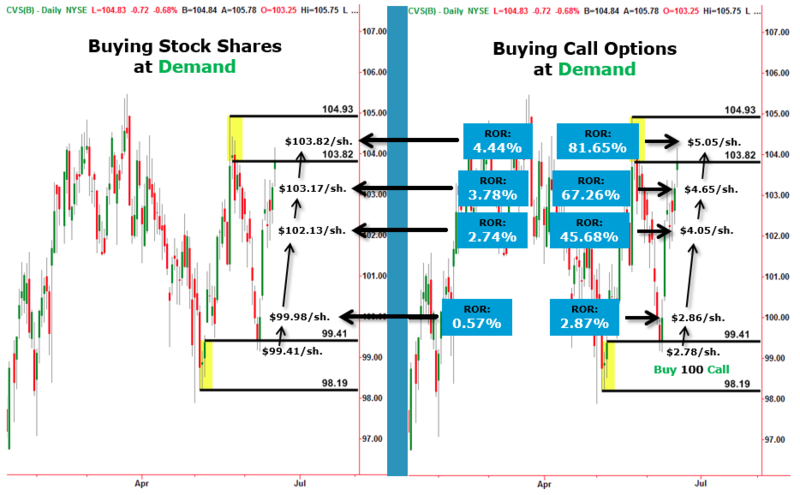 It’s not unreasonable that traders ask themselves, “Why should I spend $100 to buy a stock when I can control it with a $5 or $10 option?” See the comparison of buying stock shares vs. option calls below. There are different types of stock options traders, and we teach strategies for all of them in our Options Trader class. Many are focusing on profiting from stock movements using Core Strategy to time entries and exits predicting whether the market is headed up or down, and then magnify their bet by trading options vs. the underlying stocks. Traders who believe the market is headed up can buy calls which allow them to buy a stock at a specific price, no matter how high the price may actually climb. Since this provides a no-risk opportunity to buy a stock and immediately sell it at a higher price, the option rises sharply in value if the stock goes up. Puts are for people who think the market is headed down; no matter how low a stock goes, they can sell it at the strike price according to the contract. Remember: there is no need to actually buy and take delivery of the stock. Other options traders are interested in the net premium they retain after the sale of their options, rather than the price of individual options. A simple example is an iron condor, which involves buying a put and a call while selling a put and a call altogether on the same stock with the same expiration date. Iron condors are used when a trader expects very limited stock movement and are constructed in a way where they provide a net credit which is the difference between the premium received when selling options and the premium paid when buying options. As long as the stock remains in a predefined range the options lose value as the expiration date approaches to end up worthless, and the trader is left with a net profit. Options can be combined in multiple ways creating all sort of options strategies which can be very conservative, less moderate or something in between. Options strategies are an important part of a trader’s capital-preservation toolkit. For example, if you own a stock and think its value might go down, you can offset some of its risk by selling a call option at today’s price. What you earn by writing the option partially offsets your potential loss. Or, if you want to buy a stock but feel it is overvalued at today’s price, you can effectively lower the price by selling a put which commits you to buy if it reaches your desired price. You make money from the put, whether or not you end up owning the stock. Advanced stock options trading tactics that produce a non-level playing field. In an efficient market, you’d expect that the price of options would get cheaper as the clock ticks toward their expiration date. And they do... but the process is not linear and that makes for some additional opportunities which, in effect, give savvy traders a non-level playing field. At Online Trading Academy, students learn how to buy puts and calls at the exact time that our supply and demand rules tell us they are cheap and about to become expensive. Part of this calculation is an understanding of “The Greeks”—five different measurements of risk, each of them named after a different letter of the Greek alphabet: Delta, Theta, Gamma, Vega (not actually a Greek letter) and Rho. Online Trading Academy options students learn how to use these measurements as they build an options strategy which can meet any investment need—from capital preservation to dramatic upside potential in good markets or bad. Many traders who become experts at trading options say they find it intellectually satisfying as well as profitable—like playing a great game of chess. Here is a way you can use your native intelligence in an enjoyable way that can also be very rewarding.